1. Preheat the oven to 180°C, gas mark 4. Halve the pears – you don’t need to peel or core them – and put them into a gratin dish in which the fruit can sit quite snugly but not overlapping. Pour the cassis and red wine over them, sprinkle with the sugar and tuck in the bay leaves. 2. Bake, spooning the juices up over the pears from time to time, until the fruits are tender right through to the centre. It’s also a good idea to turn the pears over a couple of times. It should take about 40 minutes for the pears to cook, but it might take a little less or a little more (do check by piercing the flesh first). 3. By the time the pears are cooked, the juice around them won’t be thick but it should still be thick enough and sweet enough to serve as it is. If you don’t think it is, then remove the pears and bay leaves and reduce the juices by boiling them a little, about 2-3 minutes, then pour them back into the dish and put the pears back in too. 4. 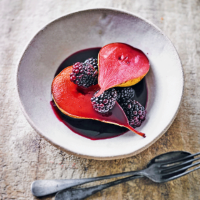 Add the blackberries, scooping the juices up over the pears once they are at room temperature. Serve with slightly sweetenedcrème fraîche.